Come watch Spring Election returns with the Jef Hall for Oshkosh Common council Campaign at Cranky Pat's in Oshkosh. We will have pizza, soda and appetizers as well as up to date information and some informal entrainment and good friends. Vote first, but come on down after polls close. 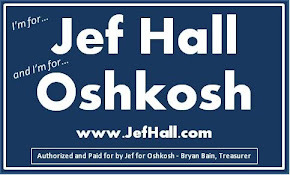 Yard signs are still available, email jef@jefhall.com with your address and we will drop one off!